I made a promise to myself that I’d eat healthier this year and I’m doing well with it so far. This healthy-eating lifestyle isn’t about buying a smaller size of jeans; it’s about being a healthier version of me and setting a good example for my son. I’m always reminding my son that a cookie isn’t a meal and making sure that he eats all his vegetables (which he thankfully loves) but I’m sure he was watching me eat poor choices like frozen pizza and cookies and wondering why I was allowed so many “treats”. Rather than making him a healthy meal and grabbing something quick & convenient for myself, I now make sure that my entire family eats healthy and well-balanced meals. With healthy recipes on the Chicken Farmers of Canada website, I can easily find delicious & healthy recipes that my entire family will love – like these Spinach Feta Burgers. I’ve already recommended this recipe to several people I know and everyone gives it rave reviews. On the Chicken Farmers of Canada website, you can easily search for the type of recipe your family would enjoy. Is there a particular ingredient that you love cooking with? You can type that into the recipe “Advanced Search” field to find several recipe options. Looking for gluten free recipes? Recipes low in carbs? Recipes that are diabetic-friendly? Simply check that option in the Advanced Search area to find a tasty listing of options. 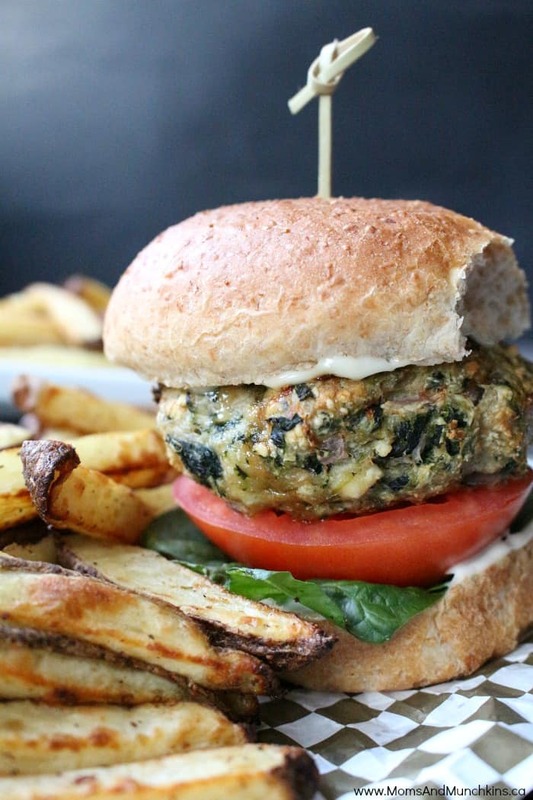 These delicious Spinach Feta Burgers start with ground chicken. Did you know that ground chicken is lower in fat and calories than many other meat sources? I often replace other meats with ground chicken in my recipes and I love the taste. Visit the Healthy Choices section for loads of information on making the best choices for your family. I love the tips on how to avoid the drive through on long road trips! You can view and print the Spinach Feta Burgers recipe on the Chicken Farmers of Canada website but I’ll walk you through the steps here. They are really easy to make and you can prepare them either in the oven or on the barbeque. This recipe makes 5 large burgers. Add all ingredients together in a large bowl and stir well to mix. Form into 5 large burger patties. For the BBQ: Preheat grill to medium-high. Place burgers on top rack, close lid and grill 15 minutes one side or until browned. Close lid and grill another 7–10 minutes or until a thermometer set in centre of burgers registers 165°F (74°C). In the oven: Bake at 425°F for 20 minutes, then flip and cook for 20 minutes on the other side or until a thermometer set in the centre of burgers reaches 165°F (74°C). Serve in hamburger buns with your favorite burger toppings like tomatoes, mayonnaise, etc. The first ingredient you start with is the ground chicken. I broke mine up a bit before adding in the other ingredients. You then add all the other ingredients to that bowl and simply stir to blend them together. Easy, right? I have a burger press so I used that to form and shape the burgers. You can just use your hands though – wet them a bit to keep the burgers from sticking to your hands. I love the spinach and feta combination. Feta is something you’ll always find in my fridge! The combination of ingredients in these burgers is amazing! They are packed with so much flavor and they are healthy for you too. I’m so excited to announce that I’ve been chosen as a brand ambassador with Chicken Farmers of Canada for 2015. I look forward to sharing tasty recipe ideas with you and telling you more about all the options you have when choosing meals for your family. Do you feel overwhelmed with all the options there on the type of chicken to buy? Chicken Farmers of Canada represents a large range of chicken farmers and they want to help you understand all of your options so you can make the best choice for your family. Chicken Farmers of Canada does a great job of explaining all of this in their Tips & Techniques section. Grain Fed – Chicken labeled as “grain fed” is stating the obvious, though some brands boast special types of grain, such as vegetarian grain. Halal – means permitted by God, or “Allah,” the Law-Giver. Muslims are taught that the animals must be well-rested and handled in a way that minimizes suffering. Kosher – means “fit” or “proper,” indicating that the food products meet the dietary requirements of Jewish law. The Jewish dietary laws are collectively known as the laws of kashruth and deal with what foods may be eaten together and how those foods are to be prepared. This recipe looks amazing! I’m craving a burger now. I might eat it without the bun and just use lettuce to keep it low carb. YUM! It was a gift from my mom but I think you can easily find them at your local grocery store (you may have better luck during the BBQ season though depending what type of climate you live in). I made these tonight and they were a hit! A simple recipe, but the flavors meld really well. For my 4-year-old son I rolled little meatballs and he gobbled them up. Thanks so much for sharing your recipe. It’ll definitely become a staple in our household. Hi Natasha! I’m so glad that you enjoyed it as much as we do! Thank you for taking the time to let me know!